Well, that was satisfying. Well, at least until you had to fight for a cab with a bunch of forlorn Cards fans. What would be great is being able to summon a cab to your location, anywhere in town. Yes, with your phone. And you can. 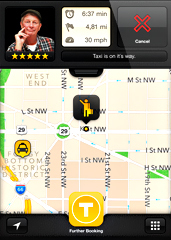 As long as it’s armed with MyTaxi, a new taxi-hailing app for iPhone, iPad or Android, now live in DC. Now, this thing comes out of Europe (DC is its first US city), but unlike other things coming out of Europe right now (economic ruin, Il Divo), you’ll find this useful. So the next time you find yourself spilling out of Nats Park with 45,000 giddy fans or marooned up Embassy Row after a particularly spirited costume party at the Swiss mansion, you’ll call up this app. It will locate the nearest taxi, estimate its arrival time and give you your driver’s photo, number and name (if it’s Bickle, don’t get in) so you can easily find each other. You can also estimate your fare ahead of time, set up cashless payments through your phone and log your favorite drivers. Bonus points for great air fresheners.